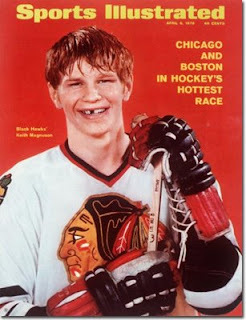 Today, I would like put a spotlight on, so to speak, Blackhawks fan favorite Keith Magnuson. Maggie was the teams enforcer during the 70's. He would never back down from a fight, even if that meant him gettimg pummelled on the ice. It happened alot, Keith lost more fights than he won, for sure. Maggie actually took boxing lessons in the off-season to improve his fighting abilities. I'm not sure if that helped or not, because I'm sure he has a losing record in hockey fights. 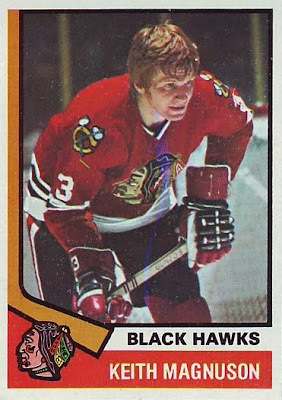 In his rookie year (69/70), Keith led the NHL with 213 penalty minutes, the following year he had a walloping 291, which at the time was a NHL record. He retired in 1980 with 14 goals, 125 assists, a +170, with 1,442 penalty minutes. 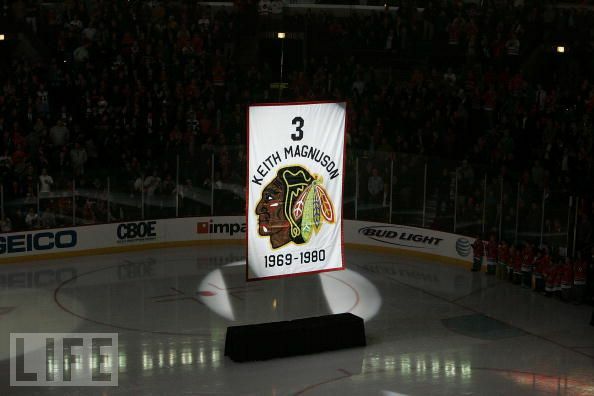 Keith was always beloved by the fans of Chicago, who respected the little redhead's courage and tenacity on the ice. Even after Maggie's disastrous run as head coach, he always remained a favorite. Unfortunatley, Keith's life was cut short. On December 15, 2003, Magnuson was killed in a car accident in Vaughn, Ontario. Former NHL player Rob Ramage was behind the wheel, and survived . Ramage would later be found guilty of vehicular manslaughter, although the story about that sad night never seems to end. On November 12, 2008, the Blackhawks retired Keith's #3 sweater, along with hall of fame defenseman Pierre Pilote, in a wonderful ceremony that didn't leave a dry eye in the house.